State and city officials, including councilwoman Jolie Justus with scissors in hand, attended the Friday ribbon-cutting to mark the re-opening of the Grand Boulevard Bridge. 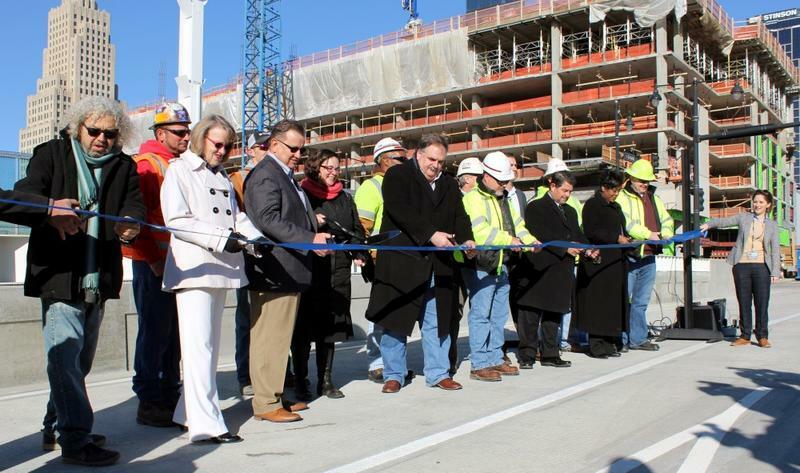 The new Grand Boulevard Bridge over I-670 in downtown Kansas City, Missouri, re-opened on Friday morning. Structural issues, such as falling chunks of concrete and cracks, led to an emergency bridge closure in May. The Missouri Department of Transportation decided the aging bridge should be torn down and replaced. Brian Kidwell, assistant district engineer for MODOT, says projects like this can take years, but a city-state partnership expedited it. "So just in a few months, we went from tearing down the bridge to actually standing out here and having this thing done," Kidwell says. The state of Missouri contributed $3.5 million to construct the new bridge. 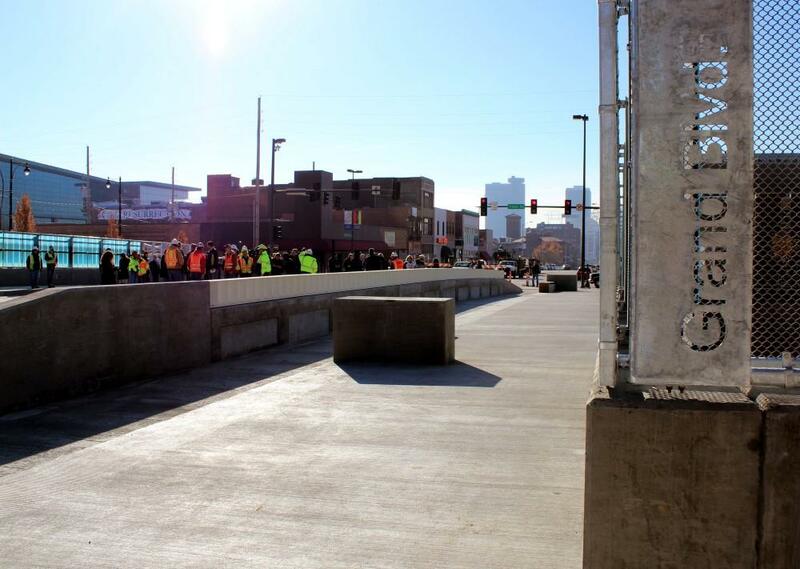 The city of Kansas City spent $1.1 million for pedestrian, cycling, and vehicular upgrades. Councilwoman Jolie Justus, of the city's 4th district, thanked state officials for asking for the city's input about what the bridge should include. "And I am especially thankful to the men and the women who spent all the time putting this in, and getting it resolved so incredibly quickly," Justus said. "So, we can start calling our constituents back and say, 'It's open today, that’s when it’s going to open!'" The city's public works department reached out to the architecture firm el dorado, inc. and artist Jim Woodfill to spearhead the design. The new Grand Boulevard Bridge includes wider sidewalks, bicycle lanes, acoustic buffering and places for pedestrians to stop and sit. For Woodfill, the new Grand Boulevard Bridge is an extension of a previous collaboration with MODOT and KCMO Public Works called Pedestrian Strands. 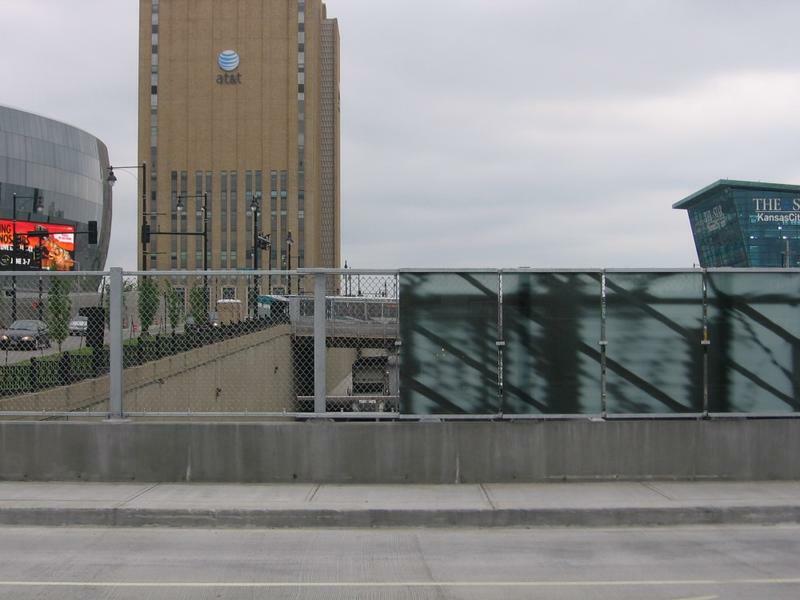 The project, completed in 2008, focused on the four bridges spanning I-670: Wyandotte, Baltimore, Main Street, and Grand Boulevard. Colored glass panels with abstracted photos, lighting, and wider sidewalks aimed to create a more pedestrian-friendly experience. "When we first started [in 2006] there were really narrow sidewalks, it was a scary thing to walk across here," says Woodfill. "And now all four of these bridges are part of a pedestrian corridor that has an open flow of movement of pedestrians across from the Power & Light [District] into the Crossroads and back and forth." This "latest iteration," as Woodfill puts it, re-works the glass panels. New additions include benches along the 12-foot sidewalks, bicycle lanes and acoustic buffering from the highway traffic. "We've opened up a vista on the west side to really explore visually the landscape through the highway, and trying to celebrate the conditions that surround the downtown area," says Woodfill. 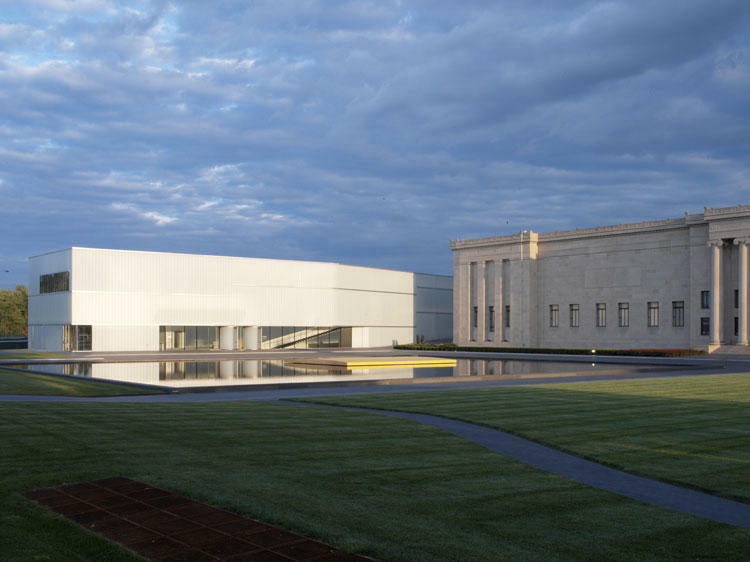 "We're real excited about what this means for public art for Kansas City and the future of this area." Two new public art projects in downtown Kansas City sound a bit like the names of emo rock bands: Pedestrian Strands and Celestial Flyways. But they're both a sign of the changing times in the downtown loop and a shifting approach to public space. 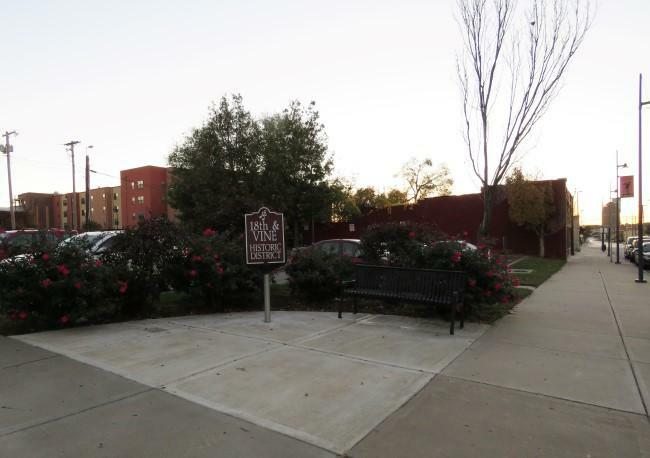 The Kansas City Council approved $7 million in funding in July for the historic 18th and Vine jazz district to stabilize historic buildings and acquire properties not under city control. The Council’s finance committee met on Wednesday and approved $44,000 in additional funding.